The beams are the horizontal elements of the shelves on which the load can be directly deposited or where shelves are placed to store small-sized products. They are easily attached to the struts using connectors or endplates, which fit into their slots. 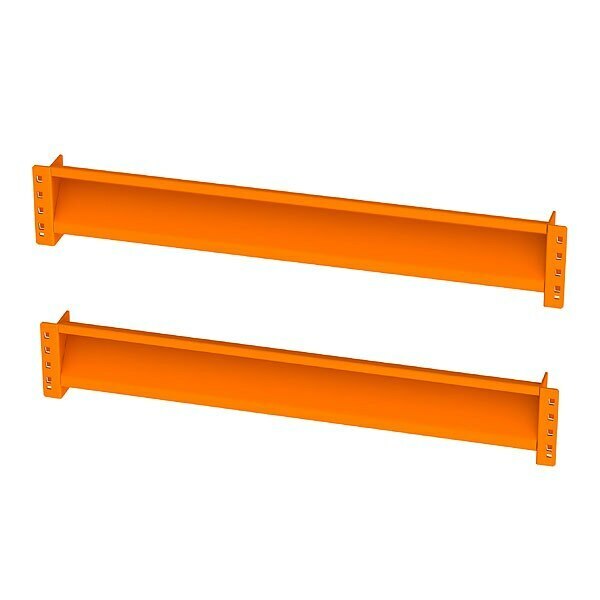 In the connection system developed and patented by Interlake Mecalux, the endplates are fitted into the central section at both ends, which considerably increases the load capacity. Each strut includes two safety pins to prevent accidental displacement. Thanks to the “Z” beam design, it can accommodate wire decking, galvanized steel panels, or particle board with almost twice the load capacity per level compared to standard bulk rack shelving units. Increases levels of heavy-duty shelves effortlessly and inexpensively, boosting the storage capacity. Available in 5 different lengths, to suit all kinds of products and needs. Best quality steel and painting processes. Max. durability: load capacity of up to 2,500 lbs.